By Mr William Goodlet, Factor. The number of cottages improved on this farm originally consisted of eight, but were reduced by the improvements to six— new ones being erected to supply the deficiency. 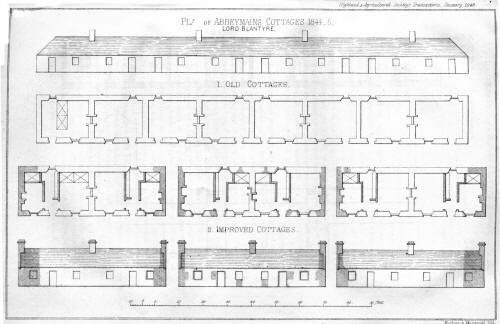 Each cottage, as appears from the accompanying plan No. 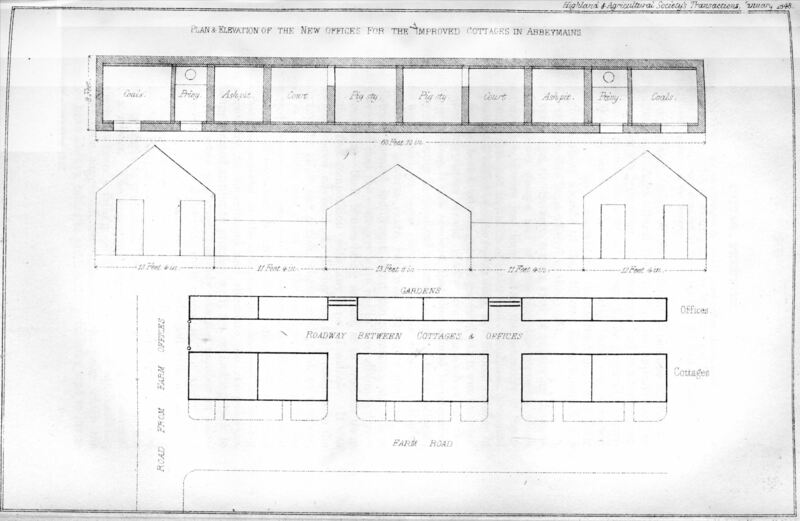 1, Plate I., consisted of only one apartment, 20 feet by 15, divided by the cotter's beds into a kitchen and pantry. The floors were of clay, the walls un-plastered; and the rafters, laid over with coarse boarding, supplied the place of ceiling. On the opposite side of the road, in front of the cottages, stood a row of ruinous pigsties and dunghills; behind were the gardens. From the ground having a considerable acclivity behind the cottages, their enlargement could only be conveniently accomplished either by heightening the walls, and adding garret-rooms, or by a new subdivision of the range, reducing their number in order to obtain the dimensions required. The former plan would have occasioned the removal of the roofs, which could not have been replaced without considerable expense ; and it was doubtful whether the old walls would have borne the additional weight thus to be thrown upon them. The latter plan was therefore adopted. In subdividing the range it was considered advisable, though at a little increase of expense in the mason-work, to have a passage between every two cottages, to give ready access to the offices to be erected behind, and to the gardens. The plan No. 2 shows how this was accomplished, and the shading indicates the extent of alteration and cutting necessary on the walls and roof. In front of the cottages flower-plots have been formed and inclosed from the road by rustic paling; and the old piggeries have been removed from the opposite side of the road, and the ground dressed up and inclosed with the adjoining field. In the new offices, each dwelling is allowed a privy, coal-house, pigsty, and ash-pit. Besides the alteration consequent on the enlargement of the cottages, each dwelling is subdivided by brick partitions into a kitchen, room, and pantry, as shown by plan No. 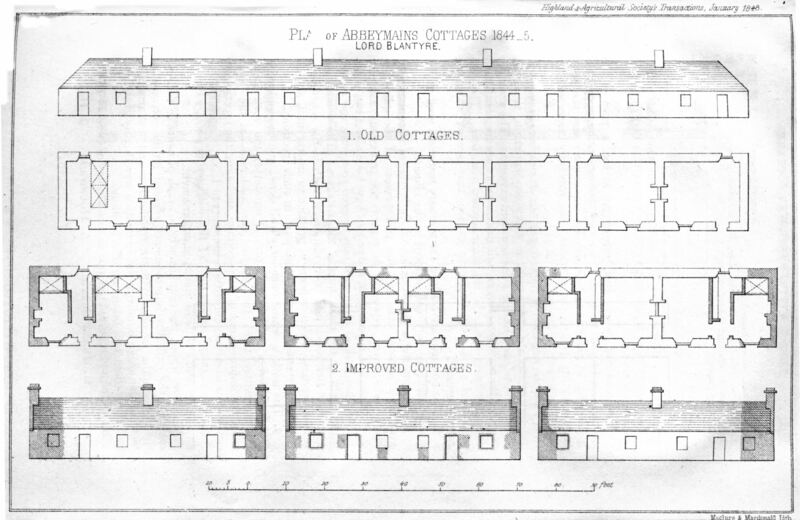 2, Plate I.; the old windows are replaced by the Society's premium cast-iron ones for cottages; the room is laid with wooden flooring, and the other floors with Caithness pavement; the ceilings are lathed and plastered, and the walls plastered. A fixed bed is put up in the room, shelving in the pantry, and grates and sweys in the kitchen. The mason-work was done by contract, and the wright-work by his lordship's carpenter. Foreign wood was used for the doors and finishings; home wood, from his lordship's plantations, for the rest. The additional stones required were taken from a quarry on the farm, and the carriages were driven by the tenant. 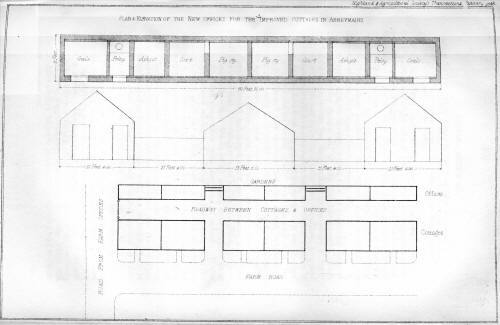 REPORT by a COMMITTEE of the HIGHLAND AND AGRICULTURAL SOCIETY on LORD BLANTYRE'S IMPROVED COTTAGES at ABBEYMAINS. 1. That the situation of the cottages (six in number) as respects amenity of climate and aspect, is every way desirable, being on rising ground, and having a fine southern exposure. The arrangement of the buildings, too, is well calculated to secure ventilation and cleanliness—and the drainage seemed complete. The cottages and out-houses, including garden, may occupy about an acre of ground. 2. The cottages are built of the ordinary materials used in the district, and are very well adapted to the climate. 3. The interior accommodation of the cottages is remarkably good and commodious, and the arrangement of the offices is highly satisfactory, especially as regards the privies and ash-pit; and although it appears that the privies have been about two years in use, they look as clean as if only erected yesterday, and reflect great credit on the cleanliness of the cottagers. The committee remarked that doors had been dispensed with in the court-yard of the pigsties, which appears in practice to answer well, and to be an improvement worthy of adoption in such erections. 4. The work appeared extremely well done, and the buildings free from damp, and perfectly dry. 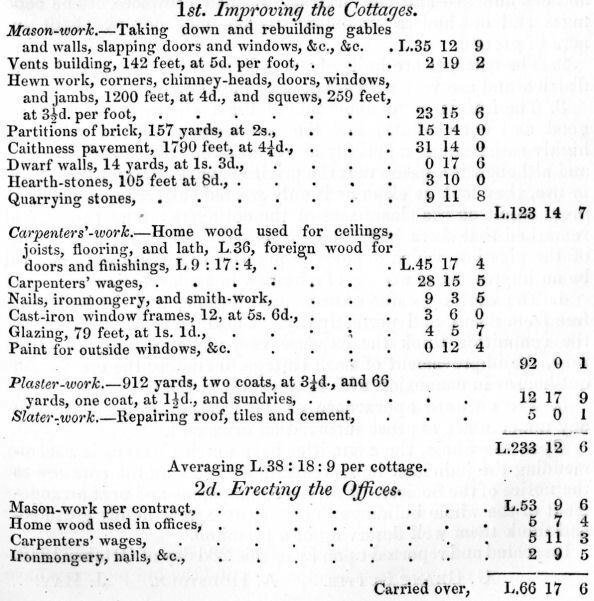 Considering the work done, the committee think the expense very moderate—at the same time, the improvement of each cottage, including the erection of out-houses in connexion with it, amounts to L.53. 5. The outward appearance of the cottages is good, without any unnecessary expense incurred on ornament. Upon the whole, the committee have much pleasure in recommending the judicious improvements effected on the cottages to the notice of the Society. With the commodious and neat arrangement of the whole buildings the committee were highly gratified, and think them well deserving of a premium. Inspected and reported upon by us this 23d day of October 1846. G. Grant Suttie. A. Houstoun. J. Hay.